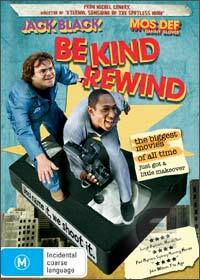 Jack Black and Mos Def star in this entertaining DVD entitled "Be Kind Rewind" which revolves around a bumbling fool called Jerry who is played by the delightful and entertaining Jack Black. Our hero Jerry unfortunately works in a junkyard and he believes that the nearby power plant is causing him headaches. In his infinite wisdom, Jerry decides to sabotage the power plant and as a result, his brain becomes magnetized causing a ripple effect at his best friend's video store that causes all his movies to be wiped. With all the videos gone, Jerry comes up with the idea of recreating these films and the two of them create some hilarious renditions of movies such as "The Lion King", "Ghost Busters" and "Driving Miss Daisy". This then causes repercussions through the local community who simply adore these remakes, however the authorities are soon informed and Be Kind Rewind soon becomes an almost comedic cat and mouse experience. Although the premise may sound a little far fetched, the end result is quite entertaining as the pair truly make some dodgy movie renditions and the relationship between Black and Def is brilliant as they bounce off each other quite well. Director Michel Gondry does a great job of making this average film quite entertaining and it even features some strong performances by Danny Glover and Mia Farrow which assists in the comedy of the movie through their seriousness. Definitely one for those enjoy a comedy without too much thinking... just enjoy the ride and remember, "Be Kind Rewind!"